Right here is the one . . . the only . . . exhibition of my non-expert opinion on where Michigan’s players will end up in (or out) of the NFL Draft. Robinson has some questions about what position(s) he’ll be able to play in the NFL. It’s pretty clear that he won’t be a full-time quarterback (although certain packages or plays wouldn’t be out of the question), but he might lack the hands and route running skills to be a wide receiver or the bulk to be a running back. My guess is that he will carve out a career somewhat like that of the Cleveland Browns’ Josh Cribbs, a guy who isn’t a star but contributes as a receiver, runner, and kickoff returner. Campbell measured in at 6’5″, 311 lbs., ran a 5.15 forty, and did 35 reps on the bench press at Michigan’s pro day. He was not very productive at Michigan and struggled to win a starting role, but he is very large and shows impressive power when he decides to stay low and play hard. There’s a chance that Robinson will be the only player drafted out of Michigan, but if there are others, the best bet appears to be Campbell for the next highest draft slot. He would fit best as a 3-technique in a 4-3 defense, in my opinion. The 5’11”, 205 lb. Kovacs was highly productive as a tackler at Michigan, although his pass coverage leaves something to be desired. He ran a 4.63 at Michigan’s pro day and showed impressive leaping ability with a 35″ vertical, but that athleticism doesn’t really show itself on the field. Kovacs played strong safety at Michigan, and that’s likely where he would fit best in the NFL – as an in-the-box safety who doesn’t have to worry too much about deep coverage. He could also be productive on special teams coverage. Roh measured at 6’4″, 271 lbs. at Michigan’s pro day and ran the forty in 4.91; somewhat disappointingly, he only put up 20 reps of 225 lbs. on the bench press. He changes direction fairly well for a strongside end, but he lacks pass rush moves beyond the occasional bull rush. Added weight seems to have slowed him down throughout his career, so he may not be able to bulk up into a 3-4 defensive end; his best bet might be to try to make it as a slightly undersized strongside end in a 4-3. Omameh is a 6’4″, 303 lb. prospect who was a four-year starter at Michigan, but he only put up 22 reps at Michigan’s pro day. He’s not particularly adept at pulling, but he has pretty good lateral movement and can stay low. If he can increase his strength and add a little bit of weight, I think Omameh can latch on as a backup somewhere, perhaps in a zone running scheme like Houston’s. Demens stands 6’1″ and 245 lbs. with a 4.82 forty and 26 reps on the bench press; he also had a 33.5″ vertical and a 4.54 shuttle time. He’s not particularly quick at diagnosing plays, but he is a thumping hitter with surprisingly good coverage skills. Demens didn’t make enough plays at Michigan to really stand out, but he could earn a shot as a middle linebacker in a 4-3; his body and athleticism also make him seem like perhaps an inside linebacker in a 3-4, but his lack of quick diagnoses make that a questionable proposition because he would have to shed linemen. Roundtree is a 6’1″, 178 lb. receiver prospect who ran a 4.58 forty at Michigan’s pro day, where he also put up just 10 reps on the bench. That forty time isn’t very impressive, but he was deceptively quick at Michigan, breaking off several 70+ yard receptions throughout his career. He has struggled to add weight at any point in his college career, and NFL defensive backs will probably be able to push him around pretty easily. He could perhaps help out as a slot receiver for someone, but he’s not fast enough or physical enough to work on the outside, in my opinion. Floyd is a 5’10”, 190 lb. defensive back who put up less than stellar numbers at Michigan’s pro day – a 4.79 forty and 5 reps on the bench press. It’s no secret that I have never been impressed with Floyd as a football player, so I won’t beat around the bush: I don’t think he has a shot at getting drafted, and his best chance would be to hook on with a team that runs a Tampa Cover Two where he can sit in the flat on a lot of plays. Barnum is a 6’2″, 297 lb. interior lineman who earned good reviews for his ability to get out and run, but he ran just a 5.53 forty at Michigan’s pro day; he did, however, put up a respectable 25 reps on the bench press. He may have been best suited for the zone running offense that Rich Rodriguez employed, but most of his playing time was earned in 2011 and 2012, when he was expected to be a powerful, drive-blocking guard. He struggled to get much movement and does not appear likely to get drafted, but perhaps a zone running team will give him a shot. Hawthorne is a 6’0″, 220 lb. prospect who benched 225 lbs. an impressive 27 times at Michigan’s pro day. He was an occasional starter at Michigan, but fell behind freshmen at weakside linebacker in each of his last two seasons. The chances of him making it in the NFL are slim, but if he does, it will probably be as a weakside linebacker in a 4-3 and/or a special teamer. Smith is a 5’6″, 172 lb. player who ran a 4.85 at Michigan’s pro day in March, although he did a little better with a 4.31 shuttle time; he also had a 30″ vertical and did 14 reps on the bench. He earned a starting job as a feature back in 2010, but that role dissipated when Brady Hoke was hired; since the beginning of 2011, he was mostly a pass protector and third down back. Without the speed to make big plays in the NFL as a third down back or returner, Smith might get just a cursory glance by a few NFL teams. Mealer, at 6’4″ and 321 lbs., ran just as fast (5.54 seconds) as Barnum, despite being two inches taller and 24 lbs. heavier. Mealer also put up 29 repetitions on the bench, which is a good number. He played center in 2012, but he seemed to struggle getting off the ball; however, I do have to say that his snaps themselves were excellent. He also had some mental gaffes, but that was perhaps in part due to playing mostly tackle and guard early in his career before becoming the full-time center. If Mealer is able to latch on in the NFL, I think it will be as a right guard for a team that likes to run the ball. Wow, I am surprised to see DR that high and as a kick returner…He is a tough guy, but isn't KR the position that gets him killed in the NFL? I don't know why KR would get him killed any more than any other KR. 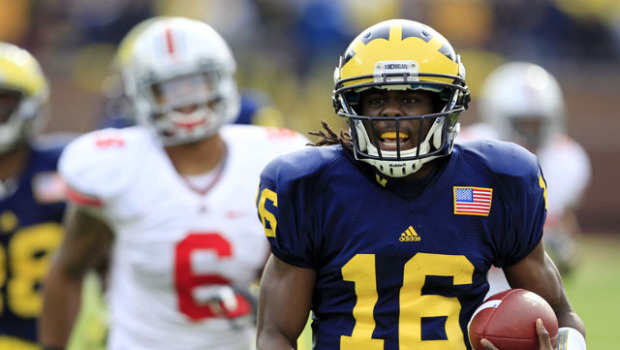 Denard is the only player who is drafted in the first 3 rounds. Kovacs, Campbell, and maybe even Demens have shots at being drafted in the 7th round. I can see all of them making practice teams at the minimum, as well as Roh and Omameh. I think it's a good call Denard going that early to NE, but I think the Packers grab him in the third round at 88. Did you pick with your heart? Just out of curiosity, why New England? I just think New England needs receivers, and they're not afraid to play around with versatile guys (Edelman was a QB and plays WR/CB, Troy Brown played WR/CB, Dan Klecko played FB/DT, Mike Vrabel played TE/LB, etc.). Do you see any Stevie Brown's in this class? Someone where the light will turn on. I guess in terms of physical ability, really the only two possibilities are Campbell and Demens. Stevie Brown was a guy who had great physical ability, but he just had a hard time understanding his role and/or doing the fundamental things necessary to get the job done. I don't think Demens fits that criteria – he's not a particularly good athlete. If you're looking for good athletes who have underachieved, my nominations for the Stevie Brown Award would be Campbell and Brandin Hawthorne. Hey, Pat White was drafted in the 2nd round (#44 overall) and Denard is a better athlete than White.